The symbol of the shamrock is unique to Irish culture and tradition. This fact is generally known and accepted in most cultures – just look at leprechauns and trinkets on St. Patrick’s Day. Shamrocks, though, are not to be confused with four-leaf clovers, although both can be associated with good luck and fortune. Although they symbolize roughly the same things, the reasoning behind the symbolism are different. 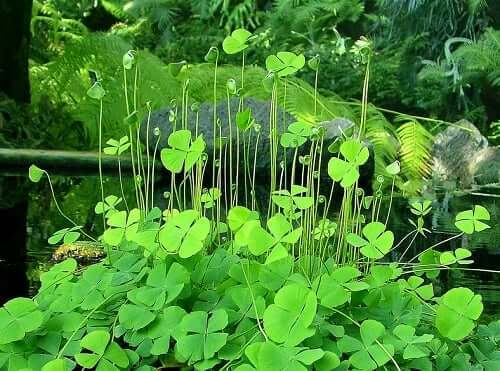 While the four-leaf clover is thought to be lucky because of its rareness, the shamrock symbol is lucky because of its abundance and prevalence in nature. Obviously there is a strong connection, one which has stood the test of time. The Celts were the first people to denote symbolic value upon the shamrock, as their culture reveres the number three. This is evident in their work with design and Celtic knots. Shamrocks were thus viewed as naturally-occurring examples of that sacred and holy number. With its three petals, the shamrock symbolic meaning represents the balancing of forces in a multitude of ways. The most well-known associate of the shamrock comes in the form of the stories of St. Patrick. He held the shamrock in the same regard as the ancient Celts, adopting it as a teaching tool. St. Patrick lived his life in a way that demonstrated its symbolism of the holy trinity: the Father, the Son, and the Holy Ghost. Some people also argue that a four-leaf clover actually completes the trinity, with the addition of mankind. They say that this causes the shamrock-turned-clover to be a symbol of humanity’s redemption and salvation. Most, though, tie St. Patrick with the shamrock only. By using the shamrock in his teachings, he illustrated how a tiny, individual plant could be so powerful and meaningful. Because of him, the shamrock and its Catholic symbolism became extremely popular among the Irish. In fact, it is still accepted as the primary spiritual meaning of the shamrock across the Christian faiths. I not only represents the holy trinity, but also three of the most decisive Christian virtues: faith, hope, and love. Across Ireland (and other countries, to be fair), dense carpets of vivid green shamrocks cover miles of fields, symbolizing their connection to abundance and joyful, healthy prosperity. This was in turn quite a good omen for farmers who wanted their grazing livestock to be well-fed. Even the scent of shamrocks play a large role in their interpretation. They emit fragrances sweet tones that have a calming effect on the body and mind, allowing the person to relax and feel content. On a nationalistic level, military groups often adored their uniforms with a shamrock as a symbol of pride and protection. During times of conflict with England, this led to Queen Victoria banning the shamrock, which only made it more widespread. Nowadays, the shamrock continues to be a patriotic symbol of strength and independence for the Republic of Ireland. As with all other features of nature, shamrock symbols can present themselves in your dreams. If you come across one while sleeping, it is usually concerning finances. True to form, it can be interpreted as a positive sign: financial gain, success in business, and noteworthy achievements are on your horizon. Some attribute this to the green color, which is known to trigger the brain to have thoughts of refinement and ensuring personal satisfaction. More obviously, at least in America, money is green. Surprisingly, the harp, not the shamrock, is the official symbol of Ireland. Nevertheless, the strength of the connection between the shamrock and this land is undeniable. The beautiful green landscape speaks for itself. Whether the shamrock is viewed as a holy symbol, a sign of abundance, prosperity, and good luck, or an emblem of patriotism, it is strongly tied to the ancient Celtic and modern-day Irish consciousness and surely will be forever.